‘In 1982, there was a bloodbath.’ Political skirmishes are not new to Belfast. Megan Pinette, the president of the Belfast Historical Society & Museum, shows her archival filing system. She is clipping articles and even printing out Facebook threads about the dispute between Belfast Mayor Samantha Paradis and the five Belfast City Councilors, documents that she is saving for posterity. The agenda for Tuesday night’s regular Belfast City Council meeting is short and fairly straightforward, with agenda items that include a request to abate $109.52 worth of property taxes and a discussion about the difficulties in finding an assistant harbormaster who can work seven months of the year. But after a week that has been marked by discord between Mayor Samantha Paradis and the five-person City Council, some in Belfast are wondering what will happen during the often-freewheeling “open to the public” portion of the meeting. During a special meeting last Tuesday held in response to the mayor’s recent opinion piece in the Republican Journal, the councilors unanimously decided that Paradis can no longer speak on the council’s behalf. They also voted to have the city leave the Maine Mayors’ Coalition on Jobs and Economic Development. All of this has led to a lot of talk around the city, including some heated discussions on social media and elsewhere. But City Manager Joe Slocum wrote in his most recent manager’s report that he believes Belfast has more positive actions happening than negative ones. But deep breaths or not, many will be paying close attention to what happens next, including Megan Pinette, the president of the Belfast Historical Society and Museum. She said she strives to take the long view of local government issues. She knows that because a trip to the archives shows that the city has been able to overcome civic strife before, with two noteworthy examples happening in the 1980s and then at the turn of the 20th century. 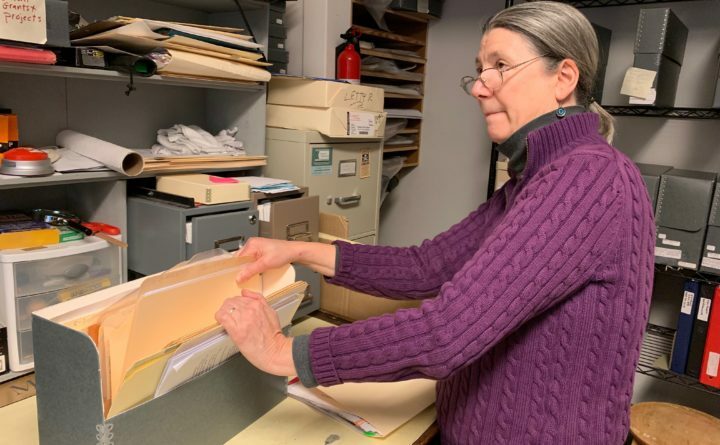 “In 1982, there was a bloodbath,” Pinette said, riffling through her collection of file folders to find the yellowing newspaper clippings that told the tale. At that time, three city councilors who became known locally as the “Young Turks” voted to fire City Manager Fred Breslin. In response, Mayor Stetson Hills resigned, writing, “You can take this job and shove it!” in ink at the bottom of his typed resignation letter to the councilors. The city was agog, Pinette said, referring to the articles, editorials, letters to the editor and more that were written as the episode unfolded. At that time, Belfast was in an economic and cultural transition. The chicken plants that employed many locals were on their way out, and a debate over the fate of the Belfast and Moosehead Lake Railroad was roiling the town. The second example that came to mind right away involved Mayor Edgar Hanson, a colorful 10-term mayor during the early 20th century, (back then, a mayoral term lasted one year) who battled all other municipal officials, including city councilors and City Hall staff. Hanson, a forward-thinking politician who worked to pave the city streets for the first time ever, has not been forgotten. He was known for his combative rallies against the so-called political “ring” at Belfast City Hall and for the somewhat passive-aggressive parades he held upon winning his elections. “I always loved the fact that he had a victory parade and marched past his opponent’s house, which was quite out of the way,” Pinette said. All in all, it was a heady time for local politics. But the city survived, and it will continue to do so, she said. As the events unfold, she will continue to clip articles from the newspapers and even print out comment threads on Facebook pages such as “You Know You Love Belfast If…” to make sure that she keeps a record of what citizens are saying. She even has a new folder dedicated to the current situation among the city’s elected officials.